If you live in a climate where the terrain is rough then you may want to consider purchasing some off-road tires for your vehicle if you don’t already have some. These tires are specifically designed to be able to cope with roads that are muddy, covered in snow, sandy, and many other different terrains. If you live in a climate where the roads are properly surfaced and there isn’t any snow, mud, sand, or anything else to deal with, then you probably won’t need all-terrain tires. 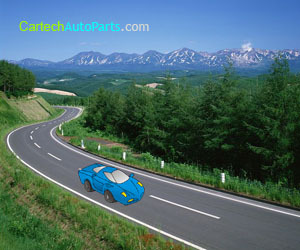 However, if you are going on a road trip where rough terrains are likely, then off-road tires are a must. The main purpose of off-road tires is to enable you to drive safely over rough terrains without the risk of slipping and sliding everywhere. They have a specifically designed grip to stop you from slipping and allow you to drive safely. All-terrain tires have smooth, horizontal treads that are specially designed for such terrains. Using these tires on normal surfaces would not be advisable as they are not designed for this. The price that you will have to pay for all-terrain tires will vary with different retailers, but they are usually quite expensive. Once you have purchased a set of all terrain tires, you are going to need to change them before you set off on your journey. If you don’t feel comfortable changing a tire yourself then it is best that you take your car to a professional mechanic who will install your all-terrain tires for you, but the process is relatively simple and easy to execute. Installing all-terrain tires is no different to changing normal tires, so most people will be able to do it. Let’s take a look at how to install your new all-terrain tires. The first thing that you need to do is to make sure that your car cannot move at all. To change a tire, you are going to need a jack. It is best to change one tire at a time, so use one jack to place under the tire that you want to change first. Make sure that you place the jack in the right place to avoid any damage to your car. Once it is in the right place you can start to jack up the car. Jack it up enough so that you are able to change the tire. Once you have done this, you can begin to loosen the nuts on the wheel and remove the hub cap. The next thing that you will need to do is to jack the wheel high enough so that you can remove the actual wheel itself. Once the tire is high enough then you can remove the nuts that you have loosened. Once the nuts are removed, you are ready to remove the tire that you want to replace. Then you are ready to place your new off-road tire onto the wheel. You should re apply all of the nuts and tighten them, and then you are done. Repeat the process for the other tires and you should have a car with a full set of new all-terrain tires. As mentioned above, if you don’t feel comfortable or confident about installing off-road tires yourself then you shouldn’t even attempt to do it yourself. You can take your new tires to a mechanic who will install them for you. This will cost you a little more, but at least you can be sure that you will be driving a safe vehicle. It will not cost you a significant amount more, and you can be sure that you are not creating a risk for yourself, or other road users.